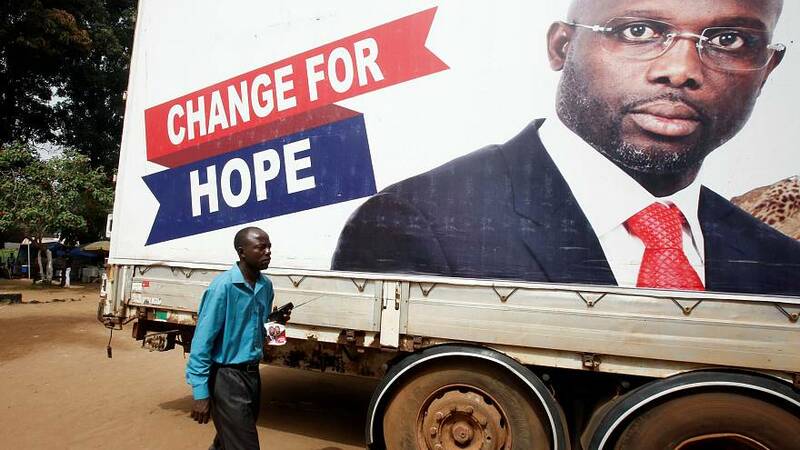 Former football star George Weah has defeated Vice President Joseph Boakai to win Liberia's presidential election run-off with 61.5 percent of the vote, based on 98.1 percent of ballots cast, the election commission said on Thursday. The announcement by commission chairman Jerome Korkoyah means Weah will succeed Ellen Johnson Sirleaf as Liberia's president next month, in what will be the country's first democratic transition since 1944. A former FIFA World Player of the Year who played for AC Milan and Paris Saint-Germain, Weah was widely considered the favourite to succeed outgoing president Ellen Johnson Sirleaf. He has been a senator in the country for the past three years. As his supporters began to celebrate, Weah tweeted to say he deeply felt "the emotion of all the nation", recognising the "responsibility of the immense task" ahead. "Change is on," he added. Earlier unofficial tallies by media outlets had consistently shown Weah to be ahead in the second round run-off vote. The US-based Carter Center said there were "notable improvements" in the handling of Tuesday's vote from the first round in October, echoing positive assessments from other international observers. The ECOWAS Observation Mission in Liberia praised people in the country for their patience, determination and peaceful conduct in the run-off. Liberia is Africa's oldest modern republic and was founded by freed US slaves in 1847. A military coup in 1980 was followed by a 14-year civil war that only ended in 2003.